Let's begin by stipulating what a number of observers have been noting for the past 24 hours or so: If this were President Obama meeting Kim, almost everyone on the Right would be excoriating him as a hopelessly weak, tyrant-appeasing neophyte who's more concerned about his precious legacy than either American national security, or the lives of suffering North Koreans. And Obama's sycophantic echo chamber, including scores of fanboys in the press, would be hailing the historic, forward-looking, Nobel-deserving courage of the American president, whose critics were cynically rooting for war. Sound about right? It should. Instead, we're analyzing President Trump's risky geopolitical gambit, so the above roles have been neatly reversed, more or less. Partisanship is a potent drug. I don’t want to be a Debbie Downer here or anything, but North Korea formally pledged denuclearization eight (!) times between 1992 and 2012. This feels like the Agreed Framework of the 90s all over again. NK gave its word to abandon its pursuit of nuclear weapons. They never intended to keep their word. And then they broke it. Reagan's famous aphorism was "trust but verify." With Kim, I'd recommend a tweak: "Hope, don't trust, and verify." That said, I do not fault Trump for throwing out the status quo playbook, which has led to many years of bipartisan failures vis-a-vis North Korea. Shaking things up, grabbing Kim's attention, and alternatively using sticks ("fire and fury") and carrots (charm offensive) to land the Hermit Kingdom's dictator at the negotiating table, in person, involved a series of bold strokes. Ramping up biting sanctions while ratcheting up bellicose rhetoric seems to have spooked the regime, at least to some degree. Kim released three hostages (let's not forget the one his goons murdered), allegedly destroyed a nuclear test site, and agreed to leave the safety of his country for a face-to-face meeting. For all of this, Trump deserves some real credit. I’m also less bothered than some by the propaganda value of the summit for North Korea. These people run the most notoriously Orwellian propaganda shop on the planet; the state itself operates as a cult with Kim as its god-king. The people have been conditioned to believe anything the regime tells them. If Kim wanted them to believe that he’d held a summit with Trump even if it hadn’t happened, his video editors would have spliced together some footage of the two and they’d have put it on state TV. If Kim wanted them to believe that Trump had surrendered the United States to Pyongyang, they’d put that on too. The idea that a state that’s willing to lie to its citizens in the most outlandish ways to secure their loyalty somehow needs a toehold in reality to further aggrandize itself in their eyes is strange to me. The propaganda value of the summit isn’t a steep cost to pay *if* it leads in the long run to NK liberalizing. If. Also, though I shared Jonah Goldberg's visceral disgust at seeing Old Glory displayed next to the banner of a totalitarian prison camp of a country, media and liberal squealing about it seems...selective. "I think honestly he's going to do these things," Trump says of Kim Jong Un, then expresses doubt, saying he may stand before us in 6 months and admit he was wrong. Then adds: "I don't know that I'll ever admit that I was wrong. I'll find some kind of excuse." 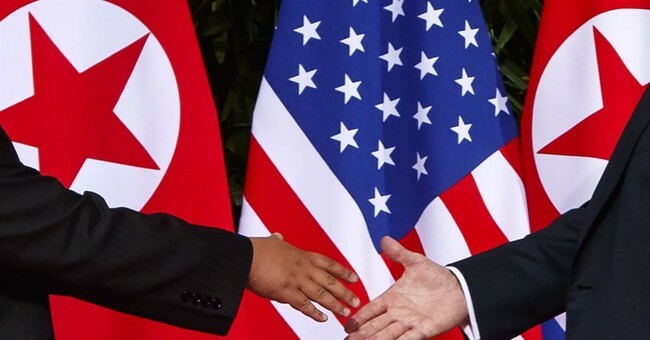 The one thing I find amusing about this summit is how confidently people were arguing not that long ago that Trump would lead to war with North Korea. The notion that the US merely returned money that rightfully "belonged to" an anti-American regime that is consistently assessed to be the top state sponsor of global terrorism is a credulous, simplistic talking point. It also glosses over how Iran has and will continue to apply significant sums of those unfrozen assets.